Most of us can think back to a period of peace in our lives, when we felt safe and free. It might have even been in the middle of hard circumstances, but we were happy because we were with those that we loved and we knew we were being taken care of by someone who loved us. In Peaceful Times I have tried to capture one of those moments of yesteryear from a faraway land. The sun finally came out again and getting out doors in the fresh spring air with the ones you care most about, helped make the perfect day. 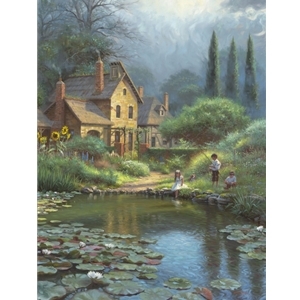 As a little boy, going down to the pond as often as could be allowed, there was something magical about it. The presence of friends or family made it even better. I hope this painting inspires you to find that special place to go and find Peace.